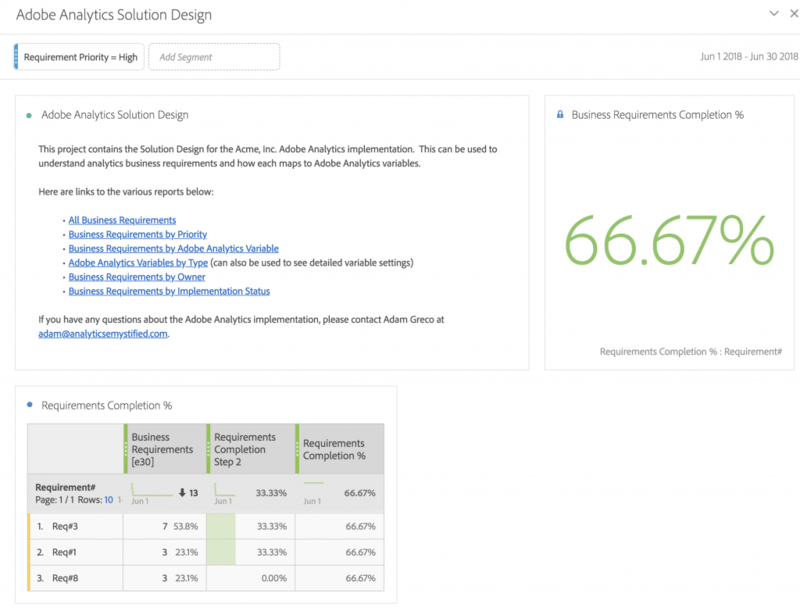 Last week, I shared how to calculate and incorporate your business requirement completion percentage in Analysis Workspace as part of my series of posts on embedding your business requirements and Solution Design in Analysis Workspace (Part 1, Part 2, Part 3). 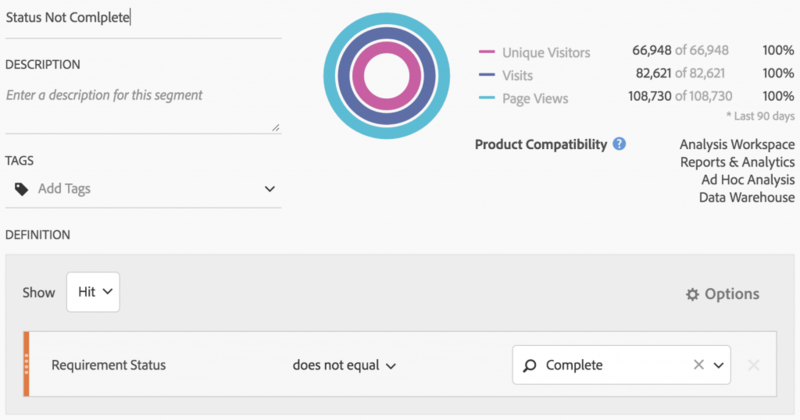 In this post, I will share a few more aspects of the overall SDR in Workspace solution in case you endeavor to try it out. 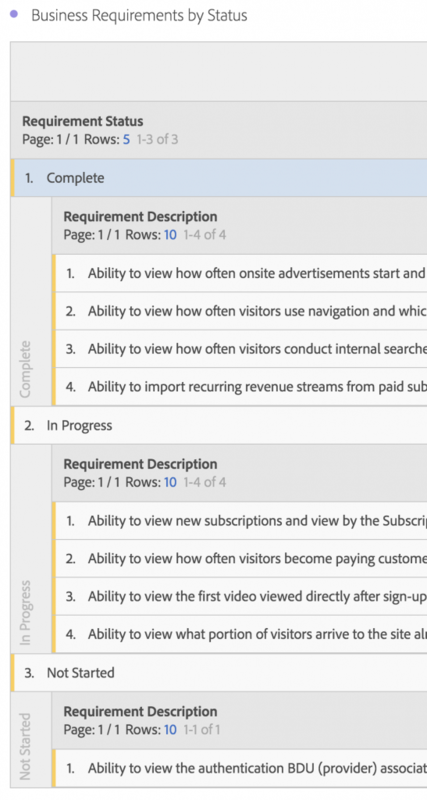 Over time, your team will add and complete business requirements. 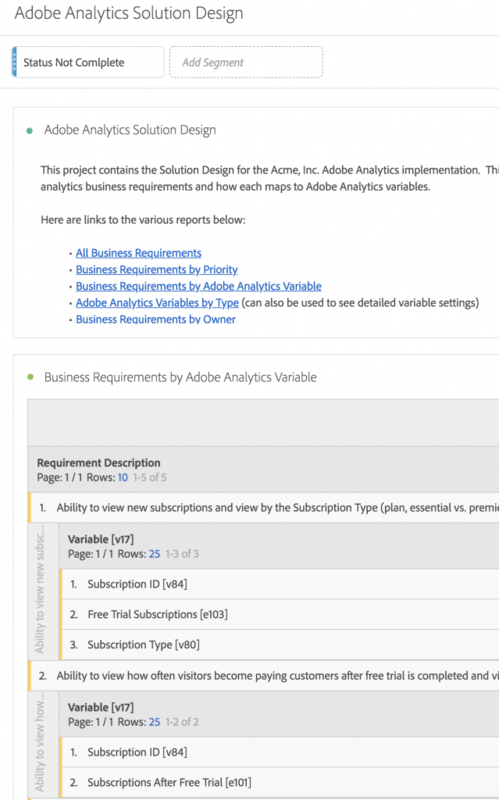 In this solution, adding new business requirements is as simple as uploading a few more rows of data via Data Sources as shown in the “Part 2” blog post. In fact, you can re-use the same Data Sources template and FTP info to do this. When uploading, you have two choices. You can upload only new business requirements or you can re-upload all of your business requirements each time, including the new ones. If you upload only the new ones, you can tie them to the same date you originally used or use the current date. Using the current date allows you to see your requirements grow over time, but you have to be mindful to make sure your project date ranges cover the timeframe for all requirements. What I have done is re-uploaded ALL of my business requirements monthly and changed the Data Sources date to the 1st of each month. Doing this allows me to see how many requirements I had in January, Feb, March, etc., simply by changing the date range of my SDR Analysis Workspace project. The only downside of this approach is that you have to be careful not to include multiple months or you will see the same business requirements multiple times. Therefore, any time you add new business requirements, the overall completion percentage would decrease, and any time you complete requirements, the percentage would increase. 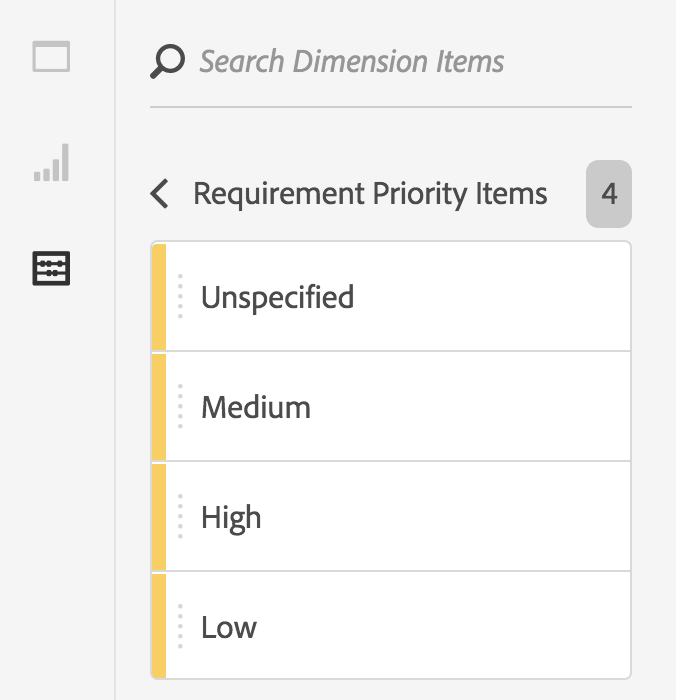 This now shows all variables associated with “High Priority” business requirements. This can be useful if you have limited time and/or resources for development. As you can see, there are some fun ways that you can use segmentation to to slice and dice your Solution Design! Pretty cool huh?